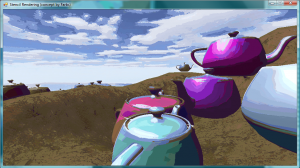 Nov. 13th Update : Added fresnel term, min/max reflection factors, pixel-perfect sampling. Back in TV3D land for a minute! 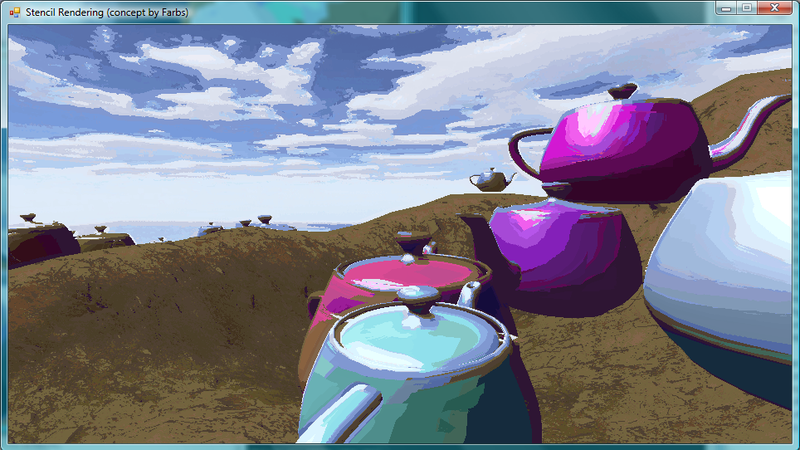 It might sound like an easy thing to do, but planar reflections are pretty challenging to do per-pixel. 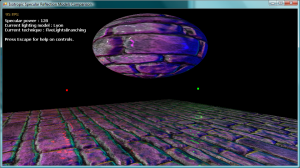 It involves a texture projection shader, some pretty scary matrix play, and so on and so forth. So I decided to make a proper sample that shows how I did it in my reflective water sample, but in its simplest expression. The floor uses two mesh groups, one for the reflection and one for the actual floor with texture. 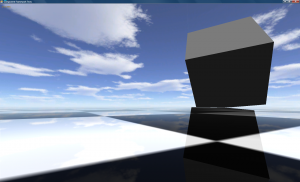 This makes it possible to only use a shader on the reflection group, and then the other one uses standard TV3D rendering. 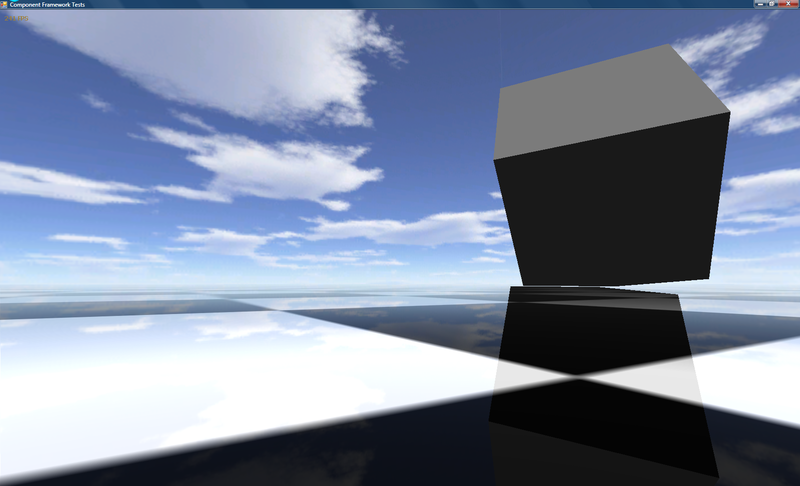 Sadly, it’s impossible to do per-pixel reflections without a shader. 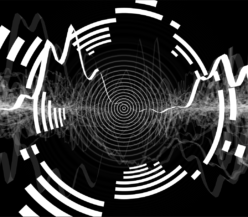 Thinking about it, an even simpler way would be to use the stencil buffer, but then if you’re working with pixels you can apply fun effects like bump-mapping and fresnel attenuation. 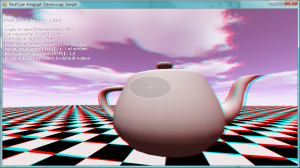 The updated version has fresnel per-pixel attenuation, which means that grazing angles will get full reflection and looking down on the floor will get next to none. 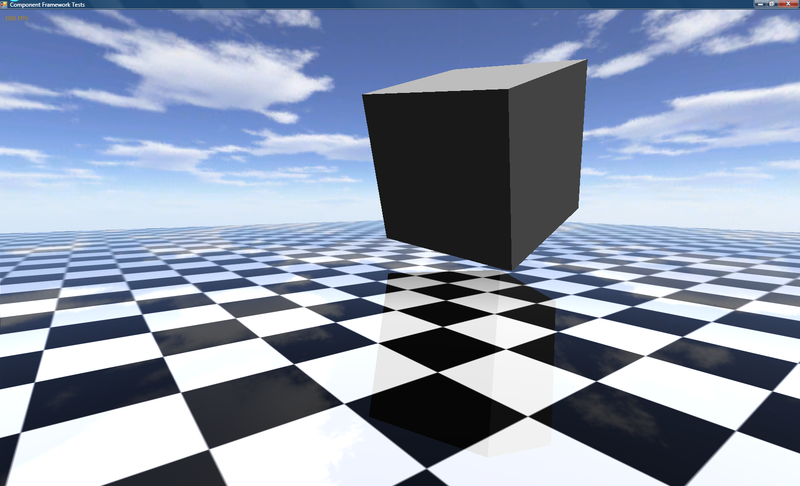 The amount of reflection and the effect of the fresnel term can be tweaked with constants. The third and last pass additively-blends the reflection with fresnel applied. 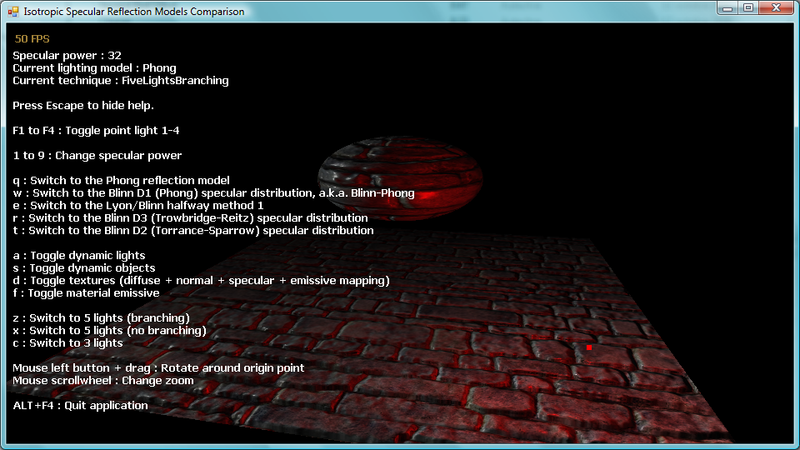 The two last passes use the shader, but since both shader passes are enabled, I only need a single group for both. Nice and clean! I also removed the texel offset thing because if you point-sample the texture (which you should, unless you’re bump-mapping), it’s pixel-perfect without any needed fix. And the blending modes and depth-write flags are moved to the shader, to make things even cleaner! I decided to finally finish up my analgyph stereoscopy sample, and cut the depth-of-field component that was adding too much complexity for my limited spare time right now. Optimized anaglyph filters for red/cyan stereoscopic rendering, to reduce eye-strain by minimizing retinal revialry but still keep some color information. 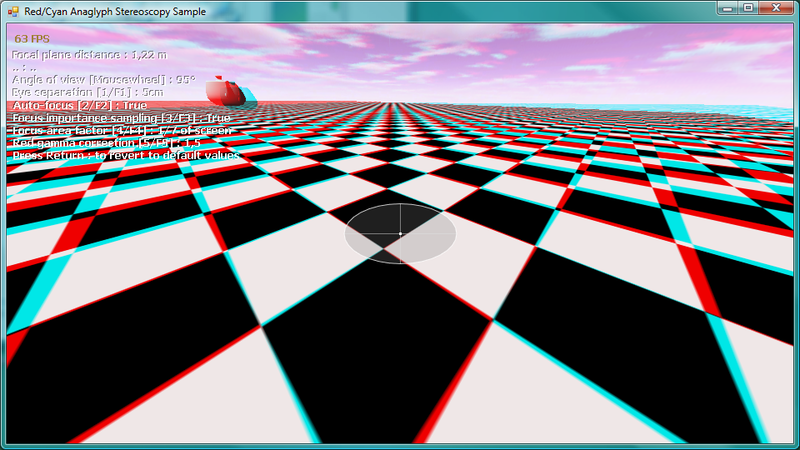 As my source suggests, I’ve also implemented red channel gamma correction in the shader. The distance between the eyes is also tweakable, if you want to give yourself a headache. 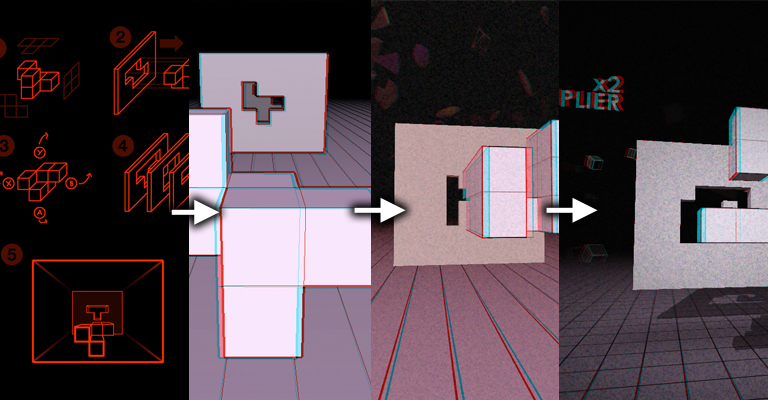 I wanted to do a stereoscopy sample to show how I did it in Super HYPERCUBE, but I can’t/don’t want to release its source, so I just re-did it properly. Auto-focus is a bonus feature that I wanted to play with; sHC didn’t need that since the focal plane was always the backing wall. This sample, like all my recent ones, uses the latest version of my components framework. There are some differences between this release and the Stencil Rendering one, but it’s mostly the same. The biggest thing is that base components (Keyboard, Sound, etc.) are not auto-loaded anymore, and must be added in the Core.Initialize() implementation. This way, if I don’t need the sound engine, I just don’t load it… makes more sense. Here’s a little demo to show off a technique that Farbs posted about earlier this week. Every frame, a random color from the target image is sampled. This color will be used as a stencil, such that every pixel whole target color is close enough to that stencil’s color will be painted. It’s a constructive painting process; every frame paints a single color, but if you wait long enough in a single spot you’ll end up with the target image. 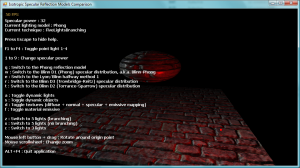 “targetBuffer” and “mainBuffer” are just two TVRenderSurfaces as big as the viewport. Since I sample from targetBuffer, it needs to be flagged with “system memory copy”. 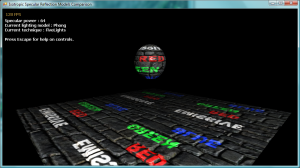 I thought this would slow things down, but it runs at very interactive framerates (60 and more). I think it’s a lovely effect. It’s very dependent on how colorful and contrasted the scene is, and it works differently for sharply-defined shapes or gradients… And of course camera movement is a big factor. In the video it gets confusing, the effect is more “painterly” if you just rotate the camera in small circles and wait for the effect to accumulate. 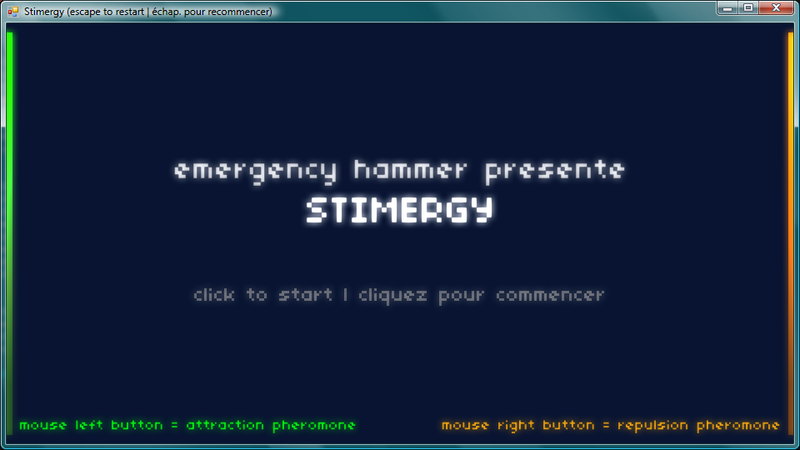 Stimergy is a game that I have made with Heather Kelley of Kokoromi for the Bivouac Urbain gamejam/competition last weekend in Québec city. Our team name was EMERGENCY HAMMER… don’t ask? 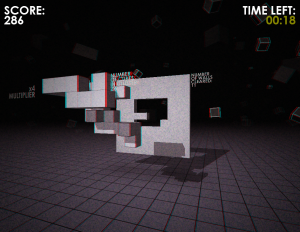 The point of the jam was to make a game in 3 days – 36 hours. And so we did. Heather did most of the game design, defined the graphics style and did the sound effects. I did the programming and some game design. I used a more recent version of my components system, which now has a sound interface via IrrKlang. It’s the same system I used for Super HYPERCUBE and Trouble in Euclidea, growing quite fond of it. Guide the ants using suggestive pheromone trails towards or away from the picnic blanket, or killer antlions. There are 4 levels. Each level has different goals, which are explained when it begins. Some have time limits. If you fail the objective, the level will restart until you get it. Escape key to restart the game from Level 1. This game uses the .NET Framework 3.5, installing it is mandatory. I suggest you install the SP1 version just in case. You will also need a bunch of DirectX DLLs that are provided by the DirectX Web Setup. 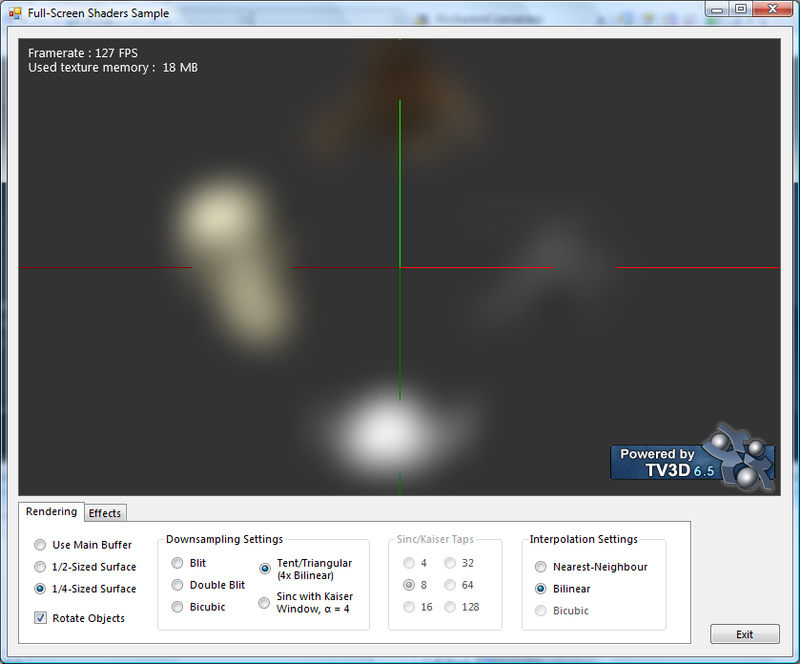 Because of the fancy blur effect, the game requires a Shader Model 2.0 compatible graphics card. This type of card is fairly commonplace now. I need a proper system for timers and interpolators, similar to what Nick Gravelyn posted, or maybe just steal that. It’s really annoying to have a dozen TimeSpan variables to keep track of what changes over time and how long the transition lasts. I need to learn other languages than C#, and other frameworks than TV3D/XNA. I’m making big efforts in my “engines” to cut down the redundant code, but even then I feel like I’m programming much more than is needed to describe the game mechanics. A big part of what makes a game actually fun, is how much direct feedback you get from interacting in the gameworld, and how much you feel like you can control these interactions. Stimergy is a pretty slow game, almost an RTS (funny, because I hate this genre), and I’ve seen other competitors value the responsiveness of player input more than the complexity of game systems, and it ended up being a lot more fun. Maybe it just fit the “jam” context better, too. I need a system for game screens. Something that puts game components in a context, that gives them lifetime. I tend to make all the major components global and automatically-loaded, which is the easiest way, but it makes game state management pretty hard. And it’s dangerous for memory usage. 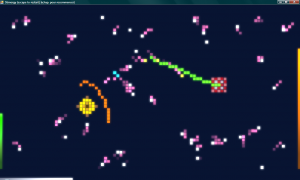 There’s actually a good XNA example that I just need to look at in detail. If I’m going to do more 2D games in TV3D, I need to build something that will load GIF animations and non-power-of-two textures. Material management for stuff that changes color or opacity was kind of a mess too. I may need to wrap it in something more concise. Switching engine would probably be the more logical choice. 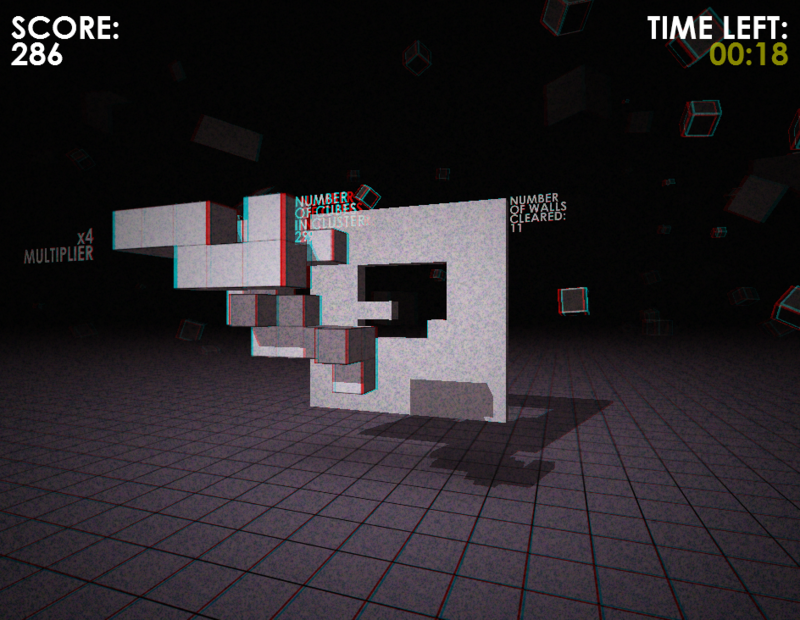 I spent silly amounts of time on tweaking graphical things that I ended up not using. This time would have been better spent balancing the difficulty level or adding more gameplay elements. 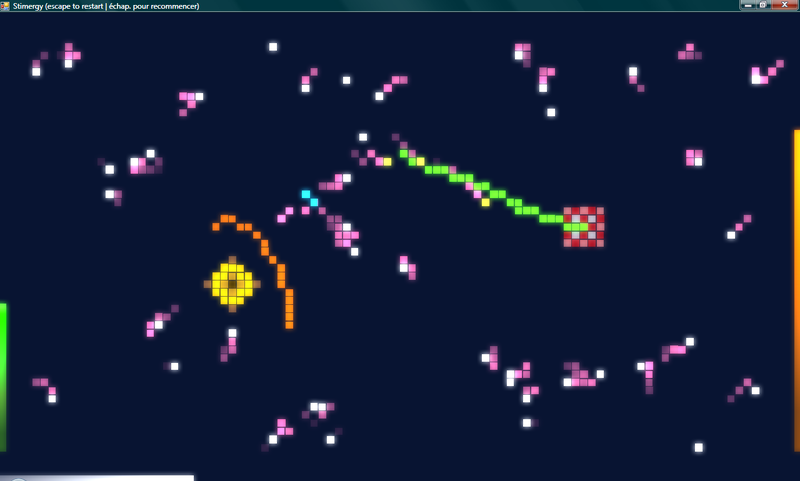 I’m used to making demos look pretty,… I have to remind myself that I’m making a game here. I may sound like I’m complaining about everything, but I’m actually really happy about how the game turned out. It’s fairly fun/challenging and it looks pretty good. I’m still wondering whether I’ll release the code because it’s kind of a mess. I suppose I will if I get a request. The source is available up in the Download section! I’ve decided to repost all my remaining TV3D 6.5 samples to this blog (until I get bored). 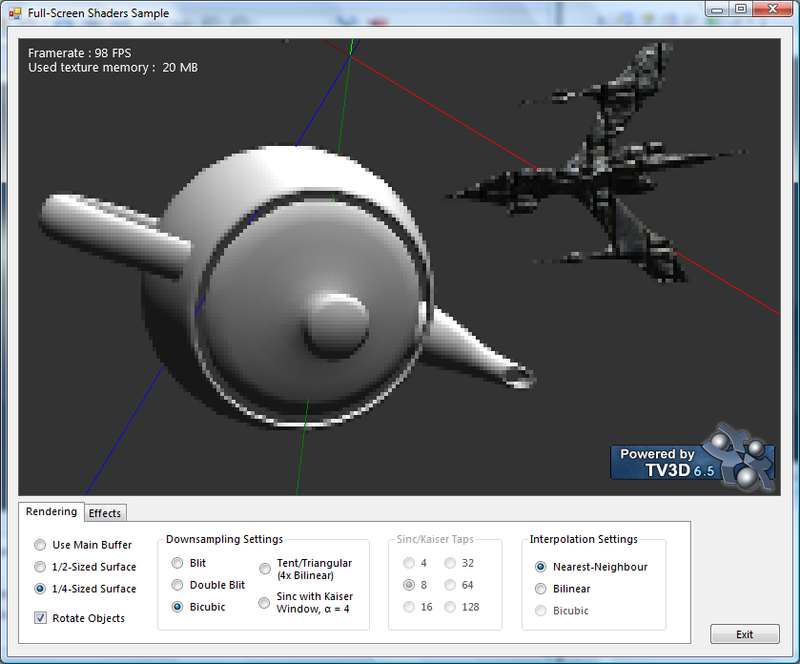 These are not new, but they were only downloadable from the TV3D forums until now! There is no support for spot lights for the same reasons, but I believe spots will be processed as regular point lights, ignoring the specific parameters. With the realtime controls, you can choose from three different techniques : FiveLightsBranching, FiveLights and ThreeLights. On SM2.0 hardware, only the third option will be valid. The FiveLightsBranching mode uses loops and “if” statements to produce dynamic branching on SM3.0 compatible hardware. This can (but may not) be benificial because only the calculations for enabled lights are performed. The FiveLights and ThreeLights modes respectively do five and three lights (WHAT YOU SAY !!) but all in a static manner. It does not just unroll the loop! Most of the calculations are done with matrices, which makes it more efficient on most hardware. To keep the shader “simple” (or to prevent from becoming even more complex…) I decided not to implement a multipass 5 lights technique for SM2.0… sorry! There’s two major categories in the models I tested : the ones that use the halfway vector, and the Phong model that works with the reflected vector. (see the Wiki entry on Blinn-Phong for details on these vectors). 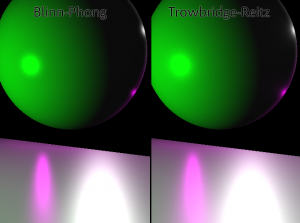 According to a paper from Siggraph 2004 called Experimental Validation of Analytical BRDF Models, the halfway methods generate specular highlights with more realistic shapes than the Phong model. I realized that myself when working on an ocean rendering shader that had a Phong specular reflection, and it was impossible to get a long grazing highlight when the sun was setting. This reformulation is interesting because it does not use the specular power literally as an exponentiation, it uses a distance metric and a much lower power value to produce very similar results to the Blinn-Phong model. 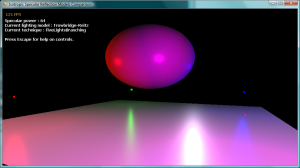 Using a high specular power (32 or more) hurts floating-point accuracy, even in full-precision mode. That said, I have seen hardware that do not have this problem. I am starting to think that it may be a driver issue, or something about mobile GPUs… In any case, the safe thing to do is choose the model that never produces artifacts, right? The two other models I implemented (Trowbridge-Reitz and Torrance-Sparrow) were “ported” from the MATLAB code in Lyon’s reformulation paper. I wanted to test them out to see if they had the same artifact problems, and how different they looked from the classic models. Trowbridge-Reitz is an interesting model because of how it looks. It’s slower than Blinn-Phong, but it has a distinct smoothness to it. The falloff of its specular highlights is softer than the other models… I’m not sure if it’s more accurate, but it looks pretty. 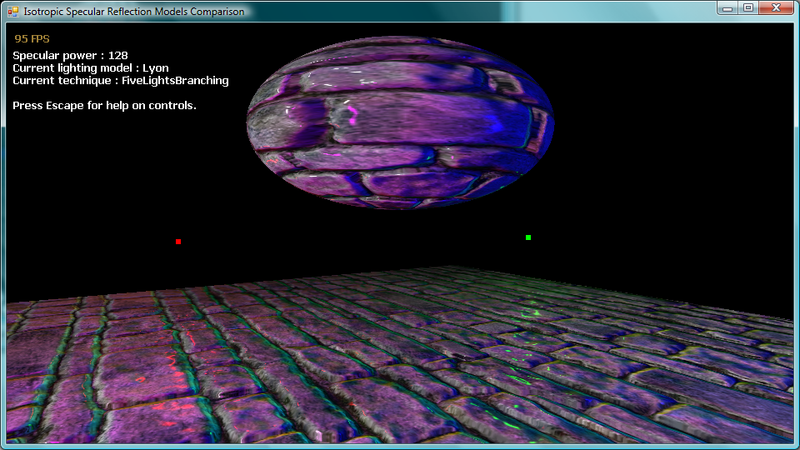 Sadly, it has the same problems with normal mapping. Torrance-Sparrow is a visual identity to the Blinn-Phong model. It’s the same thing, but slower and more instruction-heavy. It does not even fit in SM2.0 with 3 lights,… So I suggest you disregard it for realtime graphics. I found that performance varies a lot depending on which technique you use, which shader model you support, how much your GPU is fillrate-limited instead of arithmetic-limited… So I’ll just say this : the Lyon model looks great, and it’s simple and fast enough to be worth considering. If you don’t experience the artifacts I describe, then the Blinn-Phong model is your best shot, but test Trowbridge-Reitz to see if it’s fast on your hardware. It’s also worth mentioning that many things could be optimized by factorizing equations into small 1D or 2D textures (or perhaps a normalization cubemap), if your GPU loves pixels and hates instructions. 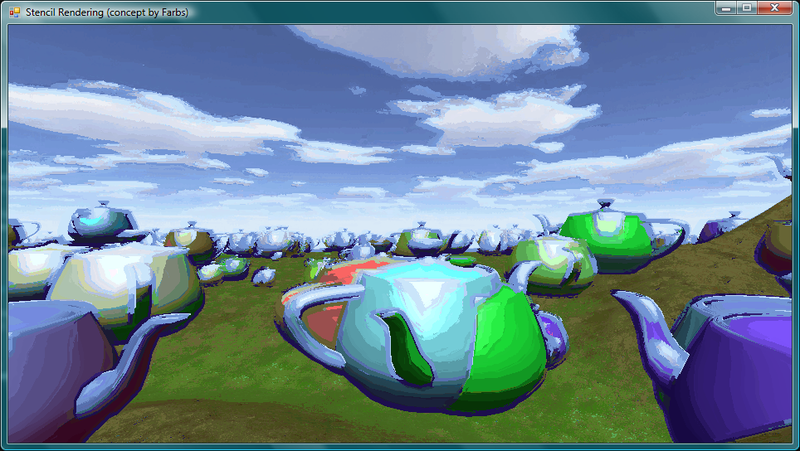 But I don’t believe that the shader can be optimized that much by reorganizing code or removing useless statements. At least not without hurting visual quality. This sample contains a major breaking change to my component framework : The Service baseclass is gone. This makes Components able to “be” services (and publish many service interfaces), and allows this sample to have a much simpler class structure… no more state classes! The components just publish whatever data they want via their service interfaces. And with the new Eventful<T> class, it’s really easy to propagate changes from a controller to a view. There is a well-known oddity in all DirectX versions (I think I’ve read somewhere that DX11 fixes it… amazing!) that when drawing a fullscreen textured quad, the texture coordinates need to be shifted by a half-texel. So that’s why if you use hardware filtering (which is typically enabled by default), all your fullscreen quads are slightly blurred. The component system was re-used in Trouble In Euclidea and Super HYPERCUBE, and I’m currently using it to prototype a culling system that uses hardware occlusion queries efficiently. The version bundled with this demo is slightly out of date, but very functional. I blogged about the service injection idea a long time ago, if you want to read up on it. This is how I consider post-processing should be done : using the main buffer directly without writing to a rendersurface to begin with. 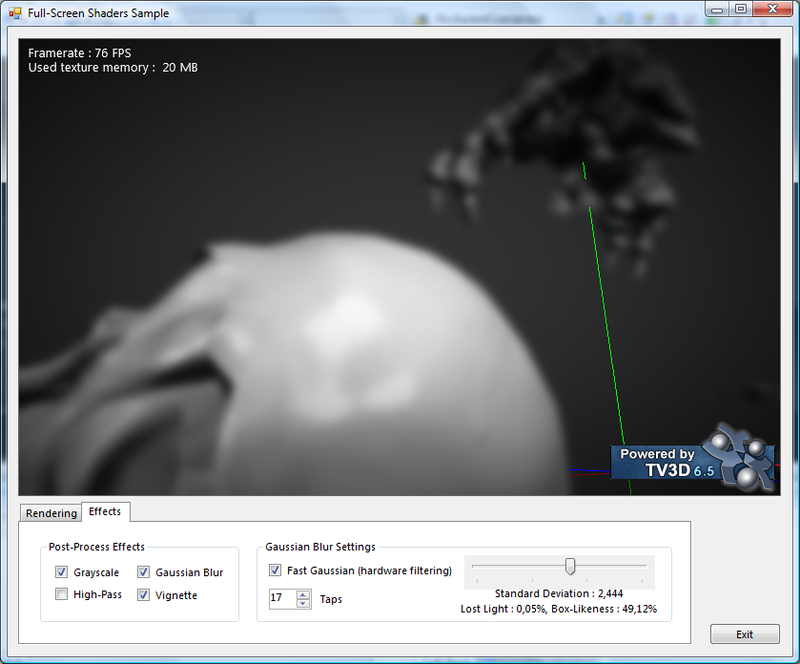 This way, the natural rendering flow is not disturbed, and post-processing effects are just plugged after the rendering is done. If you can work directly with the main buffer (no downscaling beforehand), you can grab the mainbuffer onto a temporary rendersurface using BltFromMainBuffer() after all draw calls are performed, and call Draw_FullscreenQuadWithShader() using the temporary rendersurface as a texture. The post-processed result is output right on the main-buffer. Any number of effects can be chained this way… blit, draw, blit, draw. Since the RS usage only lasts until the fullscreen draw call, you can re-use the same RS over and over again. If you want to scale the main buffer down before applying your effect (e.g. for performance reasons, or to widen the effect of a blur), then you’ll need to work “one frame late”. I described how this works in this TV3D forum post. 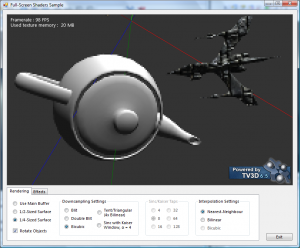 Blit : Simply uses BltFromRenderSurface onto a half- or quarter-sized rendersurface. A single-shot 4x downscale causes sampling issues because it ignores half of the source texels… but it’s fast! Double blit : 4x downscaling via two successive blits, each recieving surface being half as big as the source. It has less artifacts and is still reasonably fast. Tent/Triangular/Bilinear 4x : I wasn’t sure of its exact name because it’s shaped in 2D like a tent, in 1D like a triangle, and it’s exactly the same as bilinear filtering… It’s accurate but detail-murdering 4x downsampling. 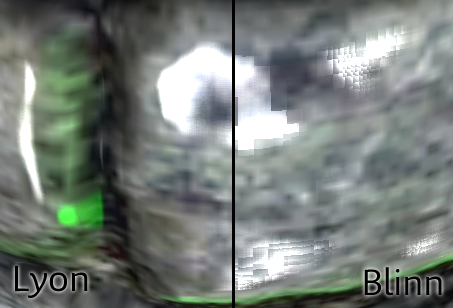 Theoretically, it should produce the same result as a “double blit”, but the tent is a lot more stable, which shows that BlitFromRenderSurface has sampling problems. The gaussian blur shader (and its accompanying classes) in this demo an implementation of the stuff I blogged about some months ago : the link between “lost light” in the weights calculation and how similar to a box-filter it becomes. You can change the kernel size dynamically and it’ll tell you how box-similar it is. The calculation for this box-similarity factor is still very arbitrary and you should take it with a grain of salt… but it’s a metric, an indicator. But there’s something else : hardware filtering! 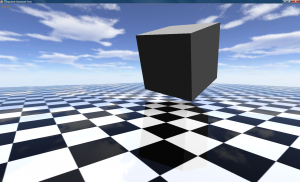 I read about this technique in a GLSL Bloom tutorial by Philip Rideout, and it allows up to 17 effective horizontal and vertical samples in a ps_2_0 (SM2 compatible) pixel shader… resulting in 289 effective samples and a very wide blur! It speeds up 7-tap and 9-tap filters nicely too, by reducing the number of actual samples and instructions. Phillip’s tutorial contains all the details, but the idea is to sample in-between taps using interpolated weights and achieve the same visual effect even if the sample count is halved. Very ingenious! If you have more questions, I’ll be glad to answer them in comments. 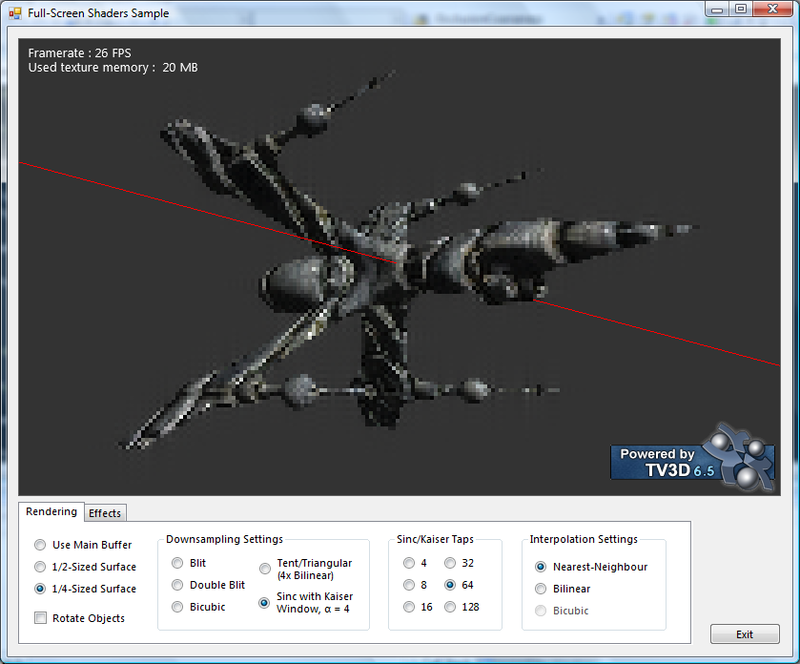 Otherwise I’ll direct you to the original TV3D forum post for info on its development… there’s a link to a simpler earlier version of the demo there, too.